With great revenue growth comes great multiple expansion. NVIDIA founder and CEO Jen-Hsun Huang. Image source: NVIDIA. Just in case it wasn't clear with NVIDIA (NASDAQ:NVDA) shares soaring to all-time highs today in the wake of a blockbuster earnings release, the graphics specialist is officially in growth mode again. Fiscal third-quarter results utterly demolished expectations, with sales of $2 billion making short work of the consensus estimate of $1.69 billion. The same is true down below, with earnings per share of $0.94 towering over the $0.69-per-share profit that analysts were expecting. 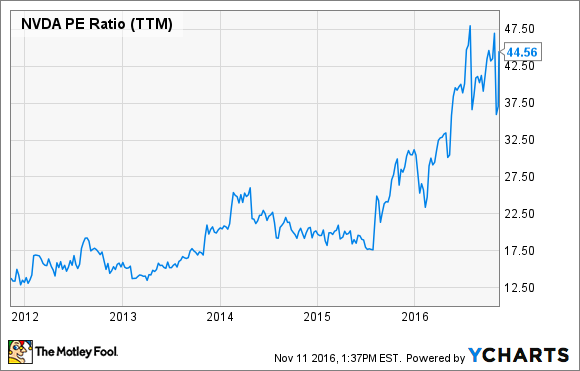 NVIDIA has crushed it this year, executing across numerous growth investments that it had been making. Prior to this year, growth rates had been fluctuating as NVIDIA's mobile business lost its way and position in the market, and Tegra's pivot from mobile to automotive was uncertain. If you're wondering why shares have more than doubled year to date, look no further than this chart that shows growth accelerating. Sales were up 54% last quarter. 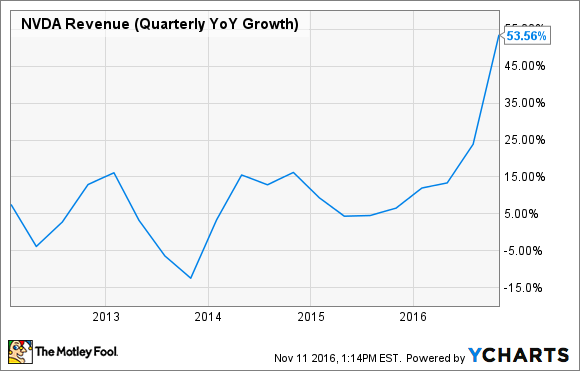 NVDA Revenue (Quarterly YOY Growth) data by YCharts. We're not just talking about large growth rates in small revenue bases in some of NVIDIA's smaller segments, although there was plenty of that. The core gaming business saw sales skyrocket as well. Of its five market platforms, three of them saw growth of 60% or more, including the primary gaming business thanks to the recent launch of NVIDIA's new Pascal processor architecture. It was never totally clear until now if NVIDIA's bets on the datacenter and automotive sectors would pay off, either, but those fears can now be safely put to rest. The company's momentum in automotive is also encouraging, particularly as that was the main sector that NVIDIA hoped would salvage Tegra's prospects as it shifted focus away from mobile devices. Specifically, NVIDIA's DRIVE PX 2 platform scored a major design win and will power Tesla's new Autopilot system that should be technically capable of full autonomy, and will be included the current Model S and Model X, as well as the forthcoming Model 3. If you're sitting on the sidelines like me (regretfully), the inevitable question is whether or not you've missed the boat or if there's still more upside in store. For what it's worth, numerous Street analysts are boosting ratings and price targets following the results, including some price targets as high as $95 (RBC Capital) to $100 (B. Riley), which suggests some potential for more gains. But you never want to chase a stock higher solely based on lofty analyst price targets. Naturally, with revenue growth comes multiple expansion, as investors price future growth expectations into shares, effectively raising the bar for how NVIDIA must perform in order to continue satisfying the market. NVDA PE Ratio (TTM) data by YCharts. For me, I'll stay on the sidelines because it will be difficult (although not impossible) for NVIDIA to generate market-beating returns after beating the hell out of the market in 2016 so far. Besides, my personal portfolio is already too tech-heavy. Well done, Jen-Hsun. Well done.